Peter Westbrook’s accomplishments can only be described in superlatives. History making winner of the bronze medal in the individual men’s saber event at the 1984 Los Angeles Olympic Games, 6 time US Olympian, and 13 time US national champion, Peter Westbrook is the first African-American to win an Olympic fencing medal, and at the time, the 1st US man in to win an Olympic medal in 36 years. And these are only his athletic achievements! 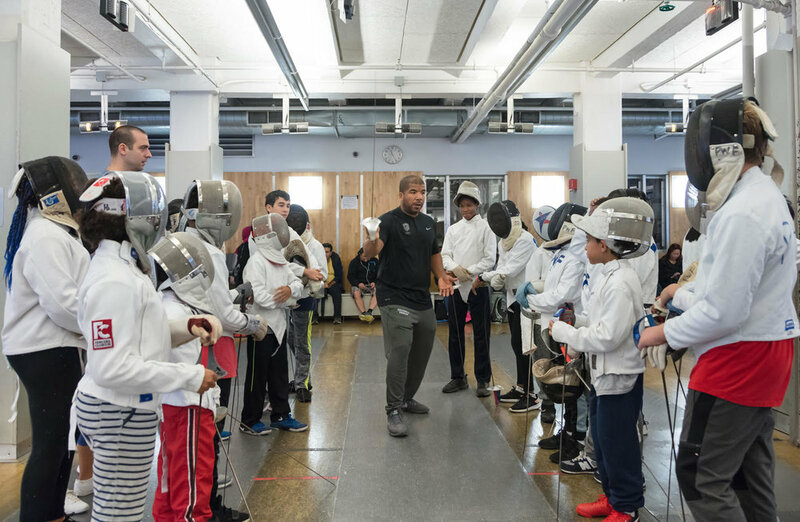 During Peter Westbrook’s 28 year career as a visionary coach and founder of the Peter Westbrook Foundation (PWF), he has has transformed the lives of thousands of children from the New York’s inner cities by providing them with fencing and academic improvement opportunities through PWF. 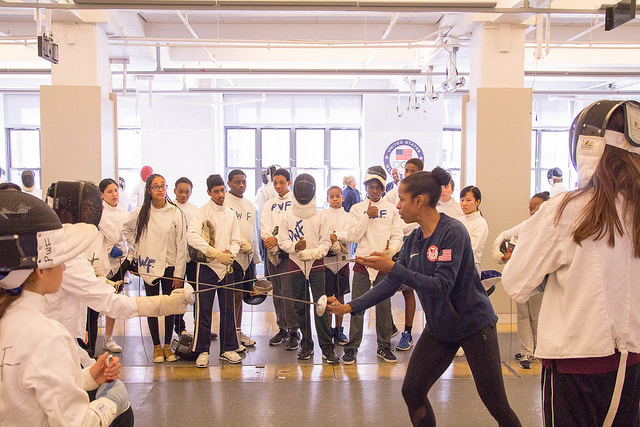 In that space of 28 years, the PWF grew from just 6 fencing students to more than 150 students a year, graduating more than 4,000 students over that period, nearly all of them from under served communities in New York. Peter and PWF laid the foundation for 8 US Olympians, 4 of whom Peter trained personally. Between them, these 8 Olympians earned 4 Olympic medals. The stories of Olympians, Keeth Smart, Erinn Smart, Akhnaten Spencer-El, Kamara James, Ivan Lee, Ibtihaj Muhammed, Nzingha Prescod, and Daryl Homer are also the story of Peter Westbrook, the visionary who overcame the odds to succeed and who inspired others to follow in his path. Peter has developed as many World Cup and Grand Prix medalists, and national champions at the Senior, Junior and Cadet levels over those 28 years. Born in 1952 in St Louis, MO to an African-American father, Ulysses and a Japanese mother, Mariko, Peter Westbrook grew up in a housing project in Newark, NJ in a single parent home with his mother and sister. His parents met in Japan after World War II, while his father, a US Army corporal was stationed there. His mother came from a wealthy minority Catholic family with a long line of samurai in their history. His father had grown up poor in South Carolina with 7 brothers and sisters. His father left shortly after the family moved to Newark, and his mother, without any qualifications, struggled to support Peter and his sister on her own. Peter’s fencing talent earned him a spot as a fencing recruit with a full scholarship to attend New York University, where he earned his BSc degree. While at NYU, Peter also trained at the Fencers’ Club with Csaba Elthes, considered to be the best saber coach in the US at the time. It was his hard work 7 days a week for 5 to 6 hours a day that won him his first national championship, and his first spot on the US Olympic team in 1976. Before taking on the running of the Peter Westbrook Foundation on a full time basis, Peter worked as a marketing executive with multi-national companies for many years. Fencing transformed Peter Westbrook’s life, and his success on the strip inspired him to give back. His own experiences inspired him to create a fencing program designed to help transform the lives of youth from inner city communities around New York like the one he grew up in. He envisioned using his tremendous talent in fencing, and his own personal story to inspire others who grew up like him to reach for opportunities unavailable within the communities they come from. The Peter Westbrook Foundation was founded in February 1991 with just 6 fencing students using space at the Fencers’ Club in New York. In this FIE Channel YouTube video, Peter talks about his vision, mission and accomplishments for the Peter Westbrook Foundation. Peter Westbrook’s vision for giving back goes beyond using fencing to transform the lives of inner city children, his expansive vision includes giving the children a shot at an academic path to a better future through an academic tuition program run by the Foundation. The culture of giving back runs strongly through PWF. The fencers who have made it, the Olympians, the champions and the older experienced kids are expected to attend the training programs every Saturday to train the new students, and to act as role models in a virtuous cycle of giving back. They all willingly do so. The Academic Enrichment Program provides customized help, providing the necessary resources for the student to accomplish their academic goals, whether its literacy skill building, preparing for admission to an NYC specialized school or test prep for college admissions. Counselors also provide students with guidance on course selections and follow up with the progress of each student. The Afterschool Leadership Program selects about 40 athletes who show outstanding motivation and talent for specialized year round training to prepare them for both domestic and international competitions. The program provides scholarships to help defray the costs of fencing club memberships, coaching, equipment and competition fees. The athletes must maintain a minimum 3.0 GPA, and they are expected to be mentors at the Saturday training sessions. Many of the athletes from the Afterschool Leadership Program have gone on to become national champions, world champions, Olympians and athlete recruits to Ivy League and other elite universities. Peter Westbrook’s remarkable leadership and visionary work to provide opportunities to inner city children who would otherwise have none through fencing could only reach its current levels with the support of many who have been inspired and humbled by him. From Robert Dow, US Fencing Olympian and retired Managing Partner of Lord Abbott, to Neil Diamond, global entertainer and former fencer to celebrities like Oprah Winfrey, Peter Westbrook has inspired others who have the resources to generously support his cause. The Foundation’s Endowment Fund was generously seed funded by Oprah’s Angel Network with a $100,000 award in 2000, followed by a $1 million anonymous donation in 2004, and a $1.5 million matching grant endowment from then Board member and a former CEO of Merrill Lynch, Bill Schreyer, in 2007. The Foundation’s 2017 Annual Report shows a more than $13.5 million Endowment Fund. It is simply amazing that one man’s vision to give back can inspire others and spur them to action in support of his cause. The Foundation enjoys generous sponsors who have given between $1,000 to more than $100,000 (see List of Sponsors) to PWF, and many who continue to support Peter’s work through PWF. 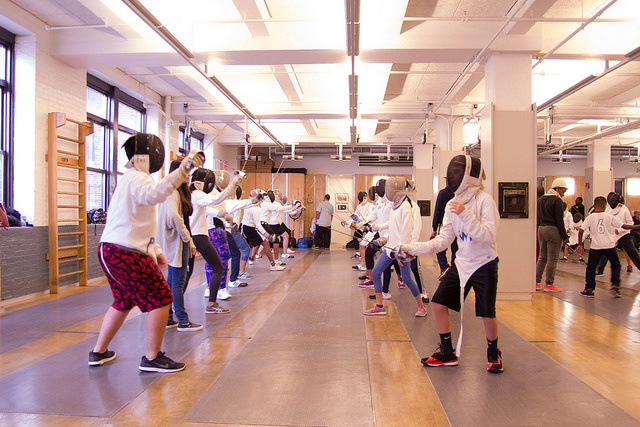 Fencers’ Club generously provides space for the Foundation’s training programs. The Foundation’s Board of Directors and its’ Advisory Board comprise former fencers and Olympians, and many more who are or who have been leaders in their professions, they all share his vision of giving back and transforming lives. Peter Westbrook is the embodiment of leadership, vision, self-less devotion, motivator, and an effective and inspired communicator. His legacy will live on through the Foundation he started. Fencing will be the platform from which children who start with little can take the opportunities presented by the Foundation to transform their lives to something much better. This article is the 2nd in our Great Fencing Coaches series. All material used for this article is from publicly available sources.